The food vault! Here I am trying my best to break into the refrigerator. If you listen closely, you can hear my voice! Does anybuddy know how to break into the refrigerator?!? If you cannot see the movie, you can click here to watch it directly on YouTube! Hmm. What about putting Harley in a harness and leash and tying him to the fridge door and then throwing his favorite toy? I bet big strong manly Harley could pull it open!! I heard you, Daisy! I hope you figure it out - I've asked Mom to put a string on the handle of our fridge, but she refuses. Bad human! We think the only way is to start by hypnotizing your human and then getting them to open it on command, Daisy. Oh Daisy, I am frustrated about that too! If you sit by the fridge and look really sad, someone will come and open it. That move works for me every time! MOL..Daisy, I would like to open that door too ! Go ! Daisy Go !!!! Well, you have seen Audrey and her attempts, so it is a common problem. I think the best is to stay nearby and jump in there really quickly when you Mom opens the door. Daisy, I've been trying to figure that one out for months!! Ths is one tough door to open!! Sorry... I don't know how to work the fridge either. I spent years trying to figure it out. It's too tough. i can't help you get in but if you do could you let me know if the light bulb stays on when you shut the door? thanks. Yoo hafta say: OPEN SES-A-ME! We like the idea of Harley pulling with his leash and harness - if you try it, make sure to use the video camera! There must be online workshops on how to open refrigerators with two paws while humans nap or are out of town...there has to be!! We haven't figured out the refrigerator yet either, but if you do please let us know. How precious & tiny your voice is! That is a tough door to crack, there might possibly come the day when it isn't quite shut all the way.......then, "bingo" your're in! Oohhh that is the ultimate challenge! You have a very sweet voice Daisy. Harry the Farm cat came in to see who was visiting. It is probably good you can not get in there; what if it closed on you. You would FREEZE. Daisy may not be the sharpest knife in the drawer but she is the shiniest. Awww Daisy your just to cute love the video. WE have to agree with everyone. We have been trying to do that for a long time. If we figure it out, we will let you know.Love your meow. That might work. Just a pitiful meow. Take care and have a great day. Wish I could not get into mine !! If you figure it out, please let us know! We heard you saying the password, but it still did not open! MOL! A girl after my own heart! When you get into that food pantry, call me! Haf a happy day. Nice try Daisy! I figured out how to open the closet doors (take that humans! that's what you get for hiding da bird in there), but no luck yet on the food vault. Daisy, we don't know how to get in ours, either. 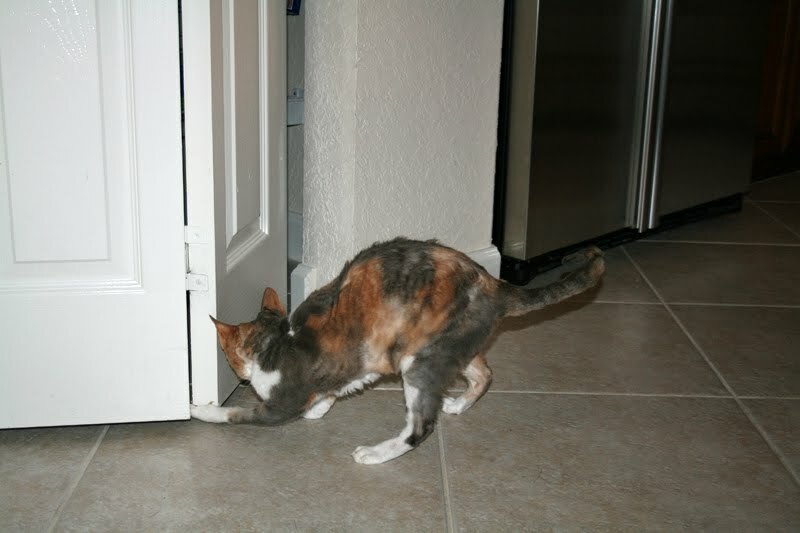 In fact, somekitty got so frustrated with it once that somebody peed on the door. Your "meow" is verreh cute! You need to get Harley to help you! Daisy, that voice would have got our mommy to open that fridge door for you! She melts when we use that meow that sounds like a cry! Sorry Daisy, we have tried but never succeeded. We will let you know if we find the secret to opening the door. Try more!!! Go, Daisy Go!!!!!!!! Daisy I think you are going to master this real soon! Your vault appears to have special doors, we don't think even Wriggley could open it...you should teach your mom that your meow is your cue for her to open the door for you! Good luck! Huffle is right. If you look at the pantry, the refrigerator or the bathroom sink faucet long enough, they magically open or turn on! The food vault is like Fort Knox it is impossible to open as there is a force keeping it closed. Wait in another room and when you hear it opening rush in to get to the food. I can't get into our food vault either. That's so wrong, isn't it? for everyone's sake, i hope you don't succeed in opening the food vault door, Daisy. because you know, if you open it and then don't close it again all the food in it will be ruined! it would be a DISASTER! you are a furry good cat-burglar! don't let that food vault get you down; we're sure you'll figger it out. maybe you can open "pocket doors", too? if so, please send instructions--we just HAVE to get in the bean litterbox room when they lock us out! Daisy! what a smart girl you are..
She had a dog that could open the frigerator but I cannot cuz I is not big enough.Or Aswell too!